Thousands of health and beauty products, including deodorant, often contain parabens. Parabens are a preservative, but in recent years have caused some concern for various health issues. Looking for a paraben free deodorant? These deodorants are worth a try for an odor-free day. Unless your armpits are naturally odor free and you rarely sweat, there’s a good chance that you apply deodorant to your underarms at least once or even twice a day. Sweat and odor is a natural part of life and deodorant helps to keep us (and those around us) more comfortable. If you browse the aisles of your favorite beauty mart or even the grocery store, there are dozens of deodorants lining the shelves. All promise to keep you smelling good and feeling dry all day long, but have you have wondered what’s in the deodorant to make it live up to the claims? There are lots of ingredients in a stick of deodorant, and common ones are parabens. If you’re looking for a paraben free deodorant, we’ve found some that work well. Check out five of our top picks. Parabens have been ingredients in various health and beauty products for decades. It wasn’t until the last decade or so that people really started to question what parabens do and if they affect our health. Parabens, which include butylparaben, methylparaben, and propylparaben, are preservatives that are put in cosmetics aand other beauty products to prevent the growth of bacteria and mold. Even though parabens have been around (and used) since at least the 1950’s, many worry that they can increase the risk of breast cancer and other health issues. After years of research, scientists determined that parabens are xenoestrogens, which act like estrogen in the body. Excess estrogen or “estrogen disruption” may cause breast cancer or reproductive issues. Some researchers suggest that the long-term use of products containing parabens can put people at a greater risk of health issues. If you want to play it safe and eliminate parabens from your life, it’s easier today than it was even a decade ago. Today, many products are paraben free, including paraben free, and it’s important to read the label. With all the deodorants available, you may wonder how we’re able to narrow down all the choices and come up with five top choices for a paraben free deodorants. We do all the research, so you don’t have to; we know how much time and money it can take to find the perfect deodorant for you. As we narrow down our choices to our favorite picks, we read dozens of reviews on the Internet and consider all the comments (good and bad) that testers have to say about a specific paraben free deodorant. Even if we personally love a product, we won’t automatically make it our top pick without considering what others have to say about it first. We use a five-star rating system to help you make a more confident decision about whether a deodorant is a right choice for you. How does our five-star rating system work? Five stars mean that a product exceeds our high expectations and has overwhelming praise from other users and reviewers. You’ll notice as you browse our top picks that every deodorant doesn’t have five stars. Even if a product has four stars, it’s still a great option. We only recommend products that we are confident enough to use ourselves, so you can feel confident about any of the paraben free deodorant choices that we suggest. Now that you understand how we rate the deodorants that we recommend let’s take a closer look at our list of the best paraben-free deodorants on the market. For your convenience, we always put our top pick, with the highest rating, at the top of our list. The rest of our recommendations are excellent alternatives to our “best overall” choice. Here are our top five picks for a paraben free deodorant. Underarmed is a natural deodorant that took two years to perfect, according to the family-owned company, Super Natural Goods. The company was started after the desire to find organic and safe health and beauty products for a growing family. Super Natural Goods has an extensive line of organic and natural products; their paraben free deodorant is one of their best-sellers. At first glance, Underarmed For Men and Women looks like a less-than-impressive product due to its no-nonsense label; if you were to see it on the shelves of a store, you might not even notice it among the brightly colored labels and graphics on other deodorants. Not only is this deodorant is free of parabens, but it’s also free of aluminum, triclosan, phthalates, and other harmful chemicals. According to the company, Underarmed is suitable for everyone from kids to adults and provides all-day protection. The deodorant is never tested on animals and is packaged with recyclable materials. The 2.6-ounce deodorant goes on clear and doesn’t leave a residue on clothing. Antibacterial agents nullify any odor-causing bacteria on your under arm skin. Cruelty Free. Gluten, Corn and Soy free. No menthol, mineral oil or salicylic acid. Don’t Sweat It is a natural deodorant that is free from parabens and is suitable and safe for men, women, and kids. The maker of Don’t Sweat It, SoapMe With Nature, is a Florida-based and family-owned business who makes a variety of natural health and beauty products. 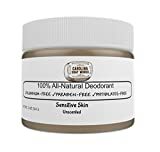 Don’t Sweat It All Natural Deodorant comes in a 3.2-ounce stick and according to the company, all you need to do is put a little dab (not swipe) it under your underarms for long-lasting odor control. Not only is this deodorant free of parabens but it is also non-toxic, organic, and free from aluminum, fragrance, artificial colors, and is cruelty-free. Ingredients in this deodorant include baking soda, arrowroot powder, coconut oil, raw beeswax, shea butter, and various essential oils. The formula is completely safe for everyone from children to adults. Schmidt’s is a natural deodorant that was first created in 2010 in a Portland, Oregon kitchen by a woman (the founder of the company) who wanted natural products for her family and friends. While the deodorant was only popular in the Portland-area for a few years, it has since grown in popularity and is available in a variety of beauty marts and grocery stores. Schmidt's Deodorant Stick is available in a variety of scents, which makes it a versatile deodorant for both men and women. The 3.25-ounce deodorant has a similar feel to non-organic deodorant sticks and is free from parabens. It is also free of aluminum, phthalates, and propylene-glycol. This natural and organic deodorant is vegan-friendly and cruelty-free. 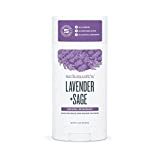 Organic ingredients include arrowroot powder, coconut oil, shea butter, baking soda, jojoba oil, and Vitamin E. Depending on the scent you choose; there is a custom-blend of essential oils. This deodorant is a little “thicker” than other types of deodorant that glide on smoothly. For best results and your own comfort, the manufacturer recommends letting your underarm body heat “soften” the deodorant a bit before you apply it and avoid over-applying. My Main Squeeze is a paraben-free and all-natural deodorant made by Carolina Soap Works. The company started out as a hobby for making natural and health and beauty products with goat’s milk and soon became a family-owned business operating out of South Carolina. For best results, the company recommends storing the jar in the fridge for about 30 minutes if the deodorant softens up too much. To apply the deodorant, simply apply a pea-sized to the underarms and rub it into the skin. There’s a good chance that you would recognize the ARM & HAMMER logo anywhere, as it’s been a staple in our homes for over a century. Whether you own a box of the baking soda or have some of the company’s cleaning products under your sink, you may be surprised to see a natural and paraben free deodorant. ARM & HAMMER Essentials Natural Deodorant may seem like an unusual type of natural deodorant, but it contains no aluminum, parabens, or colorants. The deodorant is available as Fresh or unscented and is a suitable vegan-friendly option. The clear 2.5-ounce deodorant looks similar to other clear sticks and doesn’t leave behind any residue. The natural ingredients include baking soda, coriander fruit oil, rosemary leaf oil, and lavander oil. It comes in a 2-ounce glass jar filled with hand-crafted and easy-to-apply paraben free deodorant. available as Fresh or unscented and is a suitable vegan-friendly option. As we mentioned earlier, the easiest way to find a paraben free deodorant (other than reading our thorough review) is to read the label on the deodorant. While all of the deodorants we reviewed and recommend are natural, there may be some ingredients that irritate your skin or scents you don’t like. Take the time to read the label and application directions before investing in a stick of natural deodorant.